The oldest grocery store in the French Quarter is also a temple to the muffaletta. : If you like a side of history with your po' boy, just know that legend holds that Central Grocery is the muffaletta's oldest still-operating purveyor. 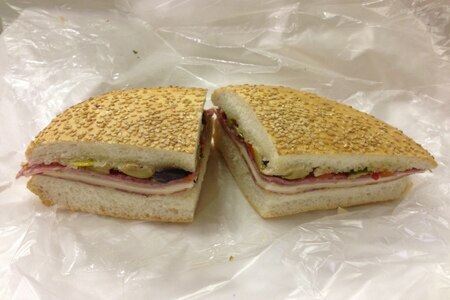 A Sicilian-American gift to New Orleans' culinary culture, the huge two-hander features soft, sesame-studded bread filled with ham, salami, mortadella, mozzarella and a marinated chopped green olive salad. Savor yours either at a counter on the premises or a bench somewhere in the Vieux Carré. You can also get a half portion, which strikes us as plenty for one person or even two with light appetites. Don't expect or offer chitchat, as efficiency in keeping the omnipresent line moving takes precedence over politesse. When you finish your meal, do some shopping. Buy the olive salad that ennobled your muffaletta, as well as hard-to-find spices and oils, Barq’s root beer, and novelty items you can only find in a real Italian grocery.